As always, Christmas is rushing in on us all, so we are all off and running with our Christmas preparations! 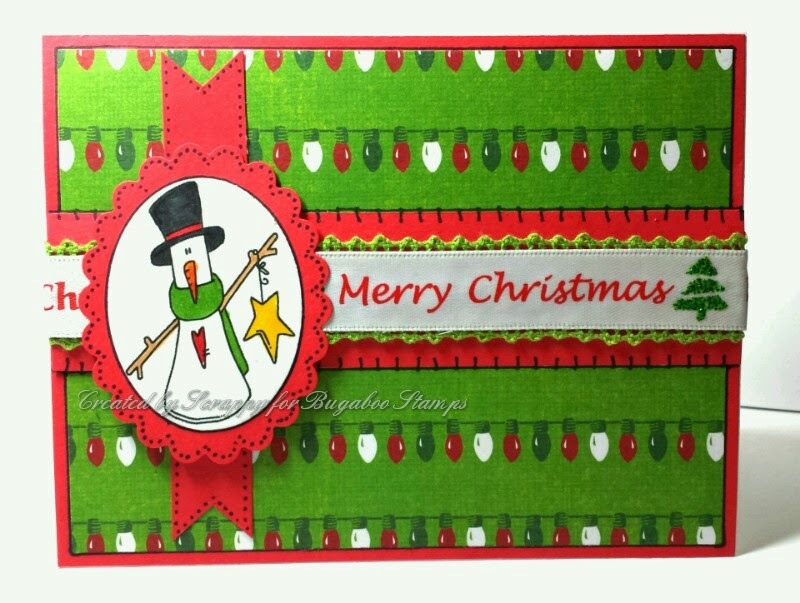 In keeping with all of this Christmas Chaos, Bugaboo Stamps is celebrating with a weeklong Christmas countdown. Rather than doing a 12 Days of Christmas theme, we have been planning a different fun themed week of challenges! Todays Stella Says Sketch has us using the wonderful sketch found HERE, to create an awesome Christmas card! My sample below features Girl Gingerbread Candy Cane! Check out this, as well as the rest of the fabulous digital stamps available at Bugaboo Stamps HERE!! (PSST! There is a HUGE SALE going on there right now too!) I hope you like my card! Der Schneemann ist ja toll. Eine sehr schöne Karte. 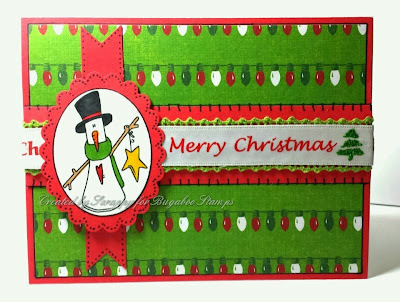 What a lovely card, thanks for joining us at Patties Creations Challenge Blog for this months theme of Christmas. What a fun card! Thanks for linking for the Dreamweaver challenge. Our Christmas Lights border stencil would be perfect with your design! Oh my gosh I simply adore, this! Those pattern papers are awesome. Thank you so much for sharing your amazing creation with us for our Christmas Challenge at 4 Crafty Chicks. Loving the bright Christmas colours! Thanks for joining us at the Sister Act Card Challenge this week. Sheena B.
ps have you checked out the Crafty Ribbons Christmas Advent ? What a cute card! Thanks so much for participating in our QKR STAMPEDE challenge!! Hope to see you again for our next challenge! !